With Mancunians New Order about to play their first gig since 2006 (and their first ever without bassist Peter Hook), and news from back home announcing the reformation of another seminal Manchester band, the Stone Roses, it's only fitting that, on arrival in Paris, clouds are gathering and rain is beginning to fall. New Order, the band that formed from the remains of Joy Division following the death of singer Ian Curtis in 1980, have been estranged before. The five-year absence that followed 1993's Republic was because, in their own words, "we were getting on each other's nerves" – and although a triumphant homecoming gig at the Manchester Apollo arrived in 1998, Hook eventually left the band in 2007. Sadly, it seems that too much murky water has passed under the bridge since for a full reunion to happen any time soon. This summer they gave separate interviews to promote a new compilation, Total: From Joy Division to New Order, but one thing was agreed: there was no way back for the original lineup. 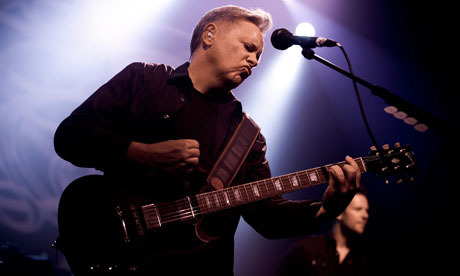 "Too many things have been said and done," said frontman Bernard Sumner. Since the split, Sumner and drummer Stephen Morris have been playing with guitarist Phil Cunningham and bassist Tom Chapman in new outfit Bad Lieutenant, whose sound is not unlike latter-day New Order. But last month came the announcement that New Order were reforming without Hook but with fourth original member (and Morris's wife) Gillian Gilbert for benefit gigs in Brussels and Paris. With Chapman on bass and Cunningham on guitar, some fans have unkindly chosen to view this new lineup as Bad Lieutenant plus Gillian Gilbert rather than New Order minus Peter Hook. Nevertheless, there is an air of expectation before the gig starts. At least half the crowd have travelled over from Britain, including past collaborators Neil Tennant from Pet Shop Boys and Ed Simons from the Chemical Brothers. On stage, New Order are greeted like returning heroes, Sumner dressed in black and looking leaner than he has for a while. After the opening "Elegia", and before they're even halfway through "Crystal", he's already done his trademark dance: a skip on the spot, a punch of the air and a "Woo!". When Sumner does his dance that early you know you're in for a great gig. Bad Lieutenant sets included several New Order and Joy Division songs, but tonight is pretty much New Order's greatest hits. From an upbeat "Regret" to an emotionally charged "Ceremony", the understated and underrated song that bridged Joy Division and New Order, they look and sound like a band rejuvenated. "Age of Consent" is a rare live treat, and though it's nearly 30 years old it sounds fresher than ever. "Love Vigilantes" is arguably even stronger, the new lineup sounding remarkably tight behind Sumner. By the time they break into a pounding "Bizarre Love Triangle", Sumner has ditched his guitar and is relishing the frontman role. He prowls the stage looking half his 55 years. "I feel fine and I feel good," he sings, dancing from foot to foot, despite the oppressive heat. A reworked and extended "True Faith" is perhaps the only dip, losing some of the charm of the original. But the reworking of "5-8-6" into a powerful, guitar-driven beast is a revelation, and "Perfect Kiss" is, well, perfect. They close with "Temptation", the stage bathed in green, and Sumner egging the crowd on to sing along. Every fan has their own dream setlist, but they'd be hard pushed to beat tonight's selection. A crisp, driving "Blue Monday" is saved for the encore, Hook's original distinctive bassline slightly tweaked by Chapman, and they finish with "Love Will Tear Us Apart". Any worries that the new New Order may look or sound like a tribute band are reassuringly allayed, though it's still odd to hear Hooky's distinctive basslines without the hirsute man himself onstage, legs apart, bass slung down by his knees. The Roses reunion proves that bands should never say never, but for the moment, there's probably more chance of Morrissey and Marr reuniting, or Liam and Noel burying the hatchet, than the original lineup of New Order playing together again. As Ian Curtis wrote in tonight's closing song: "Resentment rides high, but emotions won't grow, and we're changing our ways, taking different roads, love will tear us apart." Excerpts taken from The Guardian. © Copyright 2011 NewOrderOnline.com, except the works of other authors. All rights reserved. © 2000-2019 Digital Republic Communications - All Rights Reserved.